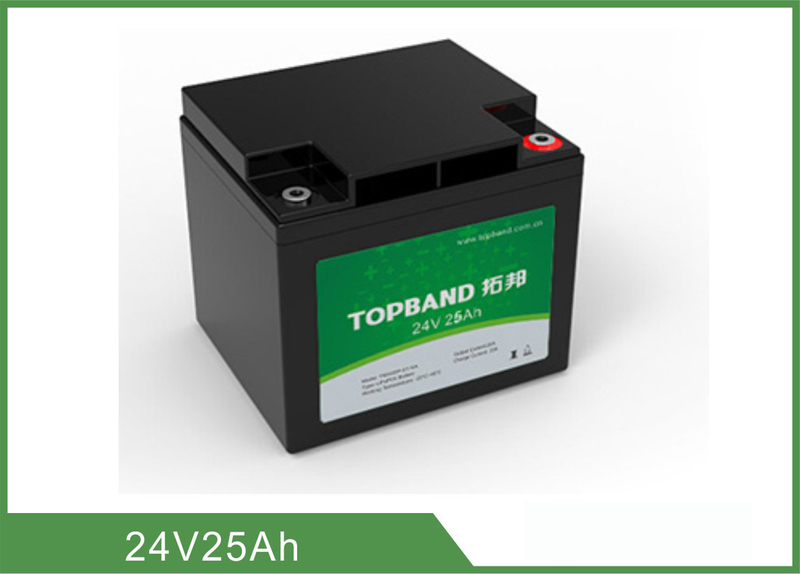 This specification applies to the TB2425F-S110A battery manufactured by Shenzhen Topband Battery Co., Ltd, Describes the type and size, performance, technical characteristics, warning and caution of the rechargeable cell. Please be sure the voltage is equal or output voltage difference less than 0.2V before parallel connection, professionals only. It is strictly prohibited any series between battery packs. 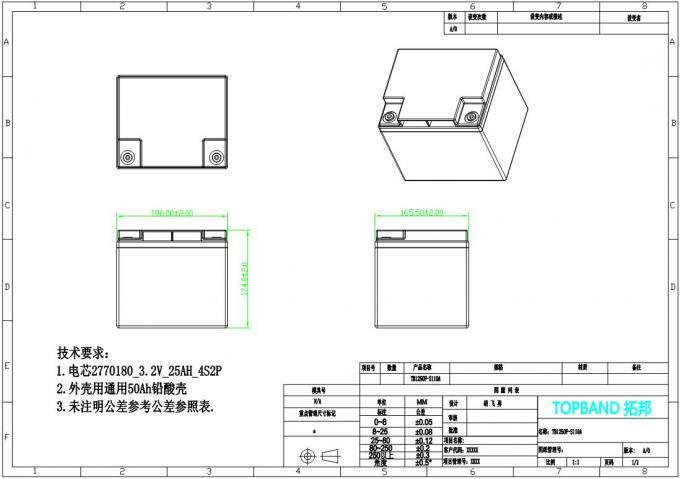 Any requirements on serials connection,please contact TOPBAND for details. 2 Nominal Capacity 25Ah Rest for 0.5~1 hour after fully charge, Using electrical loader to connect with the battery output port, and discharge with constant current 0.2C till it can’t discharge. Do the cycle three times, if there is one time that the discharge time is equal or more than 285minute , you can stop. 3 Short circuit protection No load ability after short-circuit .comeback capability of loading after remove the lead away, Short the pack with the lead (<20mΩ). If remove the lead away, connect the electronic loader with P+, P- of protection board again, so load ability comes back. 4 Allowed Maximum continuous charge Current 25A charging with this current for more than 0.5h and the added temperature of battery pack less than 20℃. 5 Allowed Maximum continuous discharge Current 25A Discharging with this current for more than 0.5h and the added temperature of battery pack less than 20℃. 7 the delay time of over current protection 10~40ms Using electron load connect with output side, discharge with more than 115A and record the voltage wave of output side with oscillograph . Numerating the time of voltage from wave to zero for voltage. 11 Over Discharge Protection furbish Charging With 0.2C Charge the battery with 0.2C for 5min and measure the output voltage (≥16V)of the battery pack. The battery should have load . 1 Short-Circuit No load ability after short-circuit .comeback capability of loading after remove the lead away, Short the pack with the lead (<20mΩ). If remove the lead away, connect the electronic loader with P+, P- of protection board again, so load ability comes back.